Optical fibres are just 'reflective tubes'. If you shine light down the tube, and it keeps going because it bounces from the walls. But if you've ever looked at optical fibres, you'll notice that they are NOT METALLIZED like a mirror, they have no silvery coating. They look like transparent fishing line. 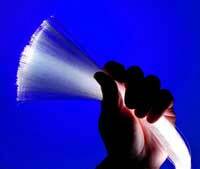 Optical fibres are used to carry signals in the form of pulses of light over distances up to 50km. They do this by Total Internal Reflection. That's why optical fibers can guide light for such long distances - because the walls of the fibre don't absorb any light at all as long as the angle of incidence is greater than the critical angle. Total Internal Reflection causes 100% reflection. In no other situation in nature does this occur, so it is unique and very useful as it is 100% efficient at transfering the light energy. When light hits the boundary between two substances it gets reflected and refracted. Light principally refracts at low angles of incidence, but as the angle of incidence increases the percentage of the light energy that reflects rather than refracts increases until the internal surface acts as a mirror. This is called TOTAL INTERNAL REFLECTION, because all of the incident light energy is reflected. The reflection then is even better than at a mirror's surface because 100% of the light energy is reflected by TIR whereas reflection at a mirror surface is never 100%. Surface scratches can lead to 'light leakage' in a single fibre. Additional layers of treated paper, PVC or metal may further protect the outside of the fibre. The core has to have a higher refractive index than the cladding so that TIR is possible. Although the cladding does not carry light, it is nevertheless an essential part of the fibre. It is not just a covering. Fibre optic cables can carry signals with much less energy loss than copper cable as copper wires lose signal energy as heat (P=I2R) due to their resistance. They are much lighter than copper cables with the same band width, so much less space is required in underground cabling ducts and costs for transportation and handling are therefore less. They can be routed safely through explosive or flammable atmospheres where are the risk of sparks from electrical cables would be to great for them to be used without a lot of precautions taken. The raw materials to make them are plentiful (silicon from sand!) whereas copper supplies are dwindling. Optical fibres are still more expensive per metre than copper because they are manufactured to a high standard and are made to carry multiple signals. Fibre-optic cables use light to transmit information over great distances at high speed. They are used widely in telecommunications because of their many advantages over copper cable.They are smaller, cheaper (overall) because you can snd more information with less 'degradation' or signal loss than other kinds of cables. Today these cables are found in local cable TV and internet connections and most international telephone networks. The fibres used in long-distance telecommunications are made of very pure glass rather than plastic, because glass does not absorb the enegy of the light signals as much as plastic does. For shorter distances, plastic is often used as it is cheaper. A Telecommunications Link is the simplest of fibre optic systems. It consists basically of a transducer (to change the electrical signal into light energy), a transmitter (that generates light pulses to travel along the fibre) , a fibre link and a receiver to detect the light gignals and transfer them into electrical output. The transmitter will normally be equipped with a laser diode that usually has an output wavelength of 1300nm or 1500nm. The fibre link will be made of single lengths of optical fibres 2km in length, which are fusion spliced (joined) together. The link will be able to carry thousands of telephone conversations simultaneously by means of time division multiplexing. This basically means that the data in multiple conversations is split up and sent down the cable. When it reaches the other end of the cable, the individual conversations This would not be possible with copper cabling. A microbending sensor consists of two plates between which passes an optical fibre. The plates have parallel grooves on their facing surfaces and the grooves from the two plates interleave with each other. The fibre passing between the plates is therefore bent alternatively up and down. When a fibre is bent sufficiently the light in the core no longer meets the cladding at an angle equal to or greater than the critical angle. Total Internal Reflection therefore does not occur. This is called microbending loss, and the more a plate is bent, the more loss occurs. This has a military application of submarine detection. If we use the correct wavelength we can measure the concentrations of specific components of blood such as total protein, cholesterol, urea and uric acid quickly. When the concentration is high, the output at the detector is less and vice versa. The concentrations of those chemicals are important to doctors in the diagnosis and monitoring of certain disease conditions. Fibre optic sensors can give results very quickly without having to send samples away to an analytical lab.